Introducing music to your child at a young has countless benefits. And we aren’t just talking about listening to, but actually giving them access to an instrument so they can create their own music. For all ages, a keyboard is an affordable way to get your child started experimenting in the word of music. And if you are looking for a keyboard, we’ve got the list for you. From preschool to teen, from beginner to the older child who intends on getting serious with their craft, we’ve chosen our favorite keyboards for kids. All you need is a little space and perhaps a pair of headphones (though some of the keyboards on this list do come with them!) and it’s time to let your child get started becoming a little Beethoven. But why is learning a musical instrument so important? Let’s take a look at the benefits of learning how to play keyboard (or any instrument for that matter) and a few things you should keep in mind when selecting the right keyboard for your child. Learning a musical instrument isn’t just about learning how to make music. There are so many other unexpected benefits. Let’s take a look at what they are! Better math skills. It’s true! Learning an instrument can help your improve your child’s math. When learning to play music kids will be learning rhythm, patterns, beats and more. This, in turn, can help kids’ brains learn and recognize numbers, fractions, and other math-related concepts. Better coordination and memorization. When it comes to piano, kids will eventually learn how to use both hands, but even as they learn with just one hand, they need to be able to read music and then play it. That takes a lot of coordination. Also, memorizing scales, notes, and even whole songs help train kids’ brains to memorize things. Nurtures creativity. Your little Mozart might not just want to learn songs but create his or her own! Playing an instrument allows for the creative juice to get flowing. Improves self-esteem. Learning a song gives kids a confidence boost. Being proficient at an instrument can help boost kids overall esteem and self-image. The proof is when you watch their faces light up when the present to you a new song they learned! There are a ton of keyboards out there, all with different features and functions. But let’s break it down to the basics. The following are some things you should think about before choosing a keyboard for your child. Most keyboards have 61 keys. Some can have as few as 24 or as many as 88. Choosing a keyboard in the 61 key range allows them to have enough octaves to learn how to play a variety of songs. Keyboards can be powered by a power supply cord, batteries or both. For most kids, choosing a keyboard that has a power supply cord or the option of both batteries and a power supply is the most economical option. Most of the keyboards on this list are great for young kids, older kids, and even adults! But those same keyboards probably aren’t great for preschoolers. While not a requirement, for kids who are just starting out with piano, choosing a keyboard with a teaching mode might be a good idea. These particular keyboards have an LCD screen that will show kids which keys to press in order to learn a song. Again, accessories are optional but for your peace of mind (and ears) if not included, you may want to consider getting a set of headphones. 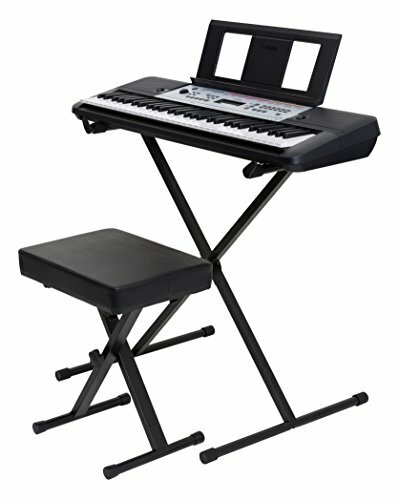 Other accessories that can be extremely helpful include a keyboard stand and a bench. Also, make sure that the keyboard comes with a power supply cord if you don’t want to be replacing the batteries frequently. Some do not include a cord and you may need to purchase one separately. Whether you are looking for more of a toy-like keyboard for your little musician or a more serious keyboard for your budding Mozart, it’s good to know that a good keyboard doesn’t need to cost hundreds of dollars. All of the keyboards on this list are affordable . For this list, we are going to start off with the *true* keyboards, one where kids can learn how to play songs and intend to use this for a few years, so they’ll be best suited for older kids. The last two picks on the list are keyboards for the younger crowd (i.e. toddlers and preschoolers) to get their creative juices flowing and help get them inspired for when they are old enough to start jamming away on a big kid keyboard. So let’s see which keyboards made the list! The RockJam keyboard is not only a great keyboard, but the whole set will give you the best bang for your buck. This set comes with everything you need to get your child started and includes not only the 61-key key keyboard but the stand for the keyboard, a bench, power supply, headphones, and a 1-month free membership a learning app called Simply Piano, to help get your kids learning piano ASAP! 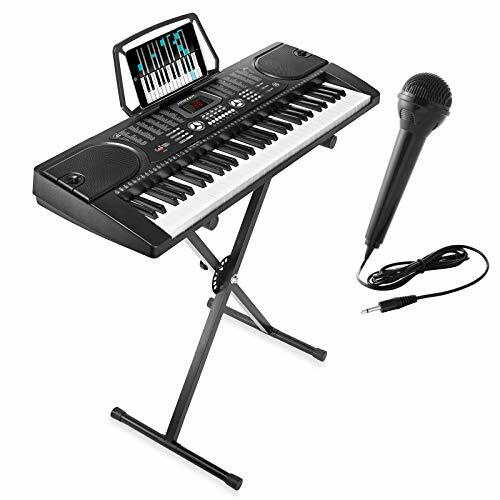 The RockJAM RJ561 is a full-size keyboard with 100 sounds and 100 rhythm patterns. It also has 50 demo songs too that kids can follow along with by watching the chords on the LCD screen. But be warned: the downside to the keyboard is that every time you turn it on, it always is at max volume, which isn’t good for little ears with headphones on or mom’s and dad’s heads when the headphones aren’t plugged in. Complete set comes with stand, bench, keyboard, power supply, and headphones. 1-month free membership to learn piano on Simply Piano app included. 50 demo songs kids can learn by watching the LCD screen. Great price for the whole package. Always starts off at max volume when you turn it on. For the kids who are just starting out learning an instrument and parents on a budget, the Casio SA76 is an affordable mini keyboard that’ll get kids interested in playing the piano. This almost 24-inch wide keyboard doesn’t take up much space. It has 44 mini-keys, 100 different sounds, 50 different rhythm patterns plus a percussion pad for kids to make some drum beats of their own. This keyboard does not come with a stand, but its small size makes it portable to move from room to room or even bring along on trips. The keyboard comes with a power supply cord but it also can be powered using batteries (which are not included). 100 different sounds as well as 50 rhythm patterns. Mini-sized keys are perfect for little hands. Lacks the range other pianos do. Won’t be suitable for furthering piano skills. 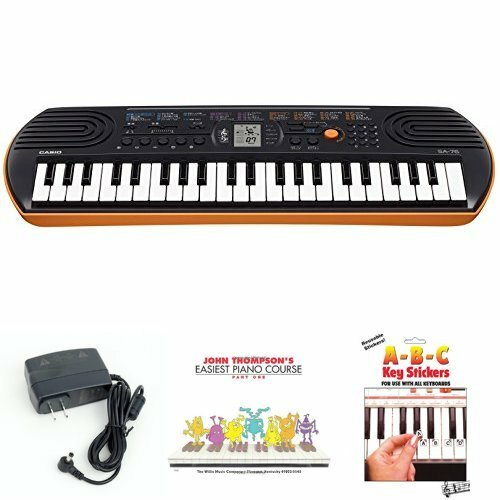 With a built-in lesson function and a free songbook download, kids will get playing right away on this Yamaha keyboard. Also, it’s another great value since it comes with the keyboard, a stand, a bench, and power supply cord. This 61-key keyboard has 400 instrument voices. Is your child ready for some musical company? This keyboard has 130 auto-accompaniment styles and 112 songs already programmed into the keyboard. It’s a perfect choice for beginners. In lesson mode, kids will learn basic songs by listening as well as watching the LCD screen show kids where to located the keys. It also has a record and playback feature just in case the kids get a song right and want to play it back for mom and dad. Complete set includes a keyboard, stand, bench, and power supply. 400 instrument voices as well as 140 auto-accompaniment styles. Lesson function teaches kids in 3 ways preprogrammed songs. Tons of buttons means it might take kids some time to learn how to use all the functions. For beginners and kids with a little piano experience, the Hamzer 61-Key keyboard is easy to set up and comes with a stand and even a microphone for kids who are looking to sing too! With 255 different sounds and 255 different rhythms, kids will have a blast belting out tunes while they play. And to capture it all, there’s a record and playback function too. And while it doesn’t come with any learning or lesson features, it is easy to use. Comes with stand and microphone. No learning functions for beginners. This 24-key playmate keyboard is made of a strong vinyl so kids can bounce away, hopping from key to key and even record their masterpieces. It also has 8 musical instrument sounds like a guitar, saxophone, and violin. 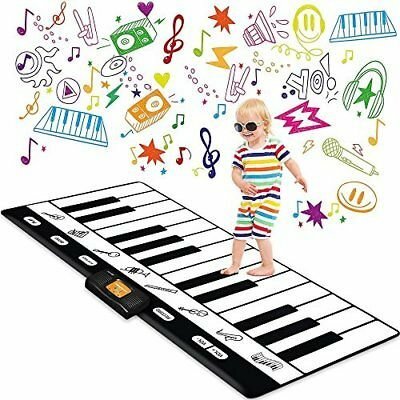 If you want to introduce your child to the world of music and let them get out their toddler/preschool energy while doing so, this fun interactive keyboard playmate will do the trick. 8 different instrument voices to choose from. It’s not a serious instrument, so for kids who want to learn piano, this obviously isn’t going to cut it. Call it a baby grand piano. 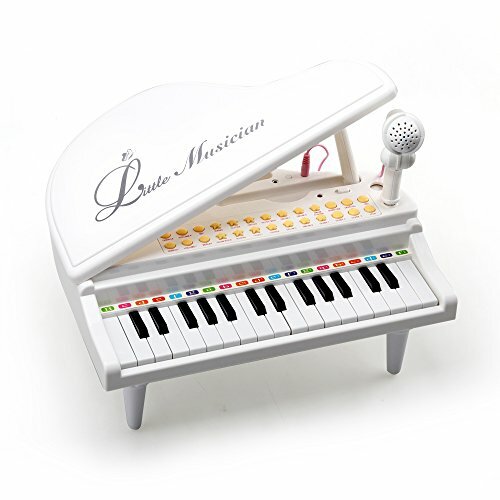 This adorable electronic piano is perfect for toddlers. It has 24 keys, 4 musical instrument sounds, percussions and even has the proper notes written above each key. The demos preprogrammed in the piano teach kids the songs by lighting up the keys. Kids can also sing along to their masterpiece with the included microphone and the record and playback feature. It’s hard for kids not to be inspired by this piano and will surely start them out on the right musical foot. Looks just like a grand piano. Sounds great for such a little piano! Kids will outgrow this one pretty fast. Q: What age can my child start learning piano? A: While there is no set age to begin learning piano and there are plenty of keyboards for extra small musicians (as you saw on the list), generally speaking, most kids do good starting piano lessons somewhere between 5 and 9 years old. The range is because it depends on how big their hands are (if they can place one finger per white key comfortably) and their interest level. Pushing kids into learning a musical instrument too early can lead to frustration and/or pushback. Q: How do I clean a keyboard? A: All those little fingers can get a keyboard dirty! Basic maintenance of a keyboard only requires some dusting with a soft cloth or feather duster. Then start (gently) scrubbing each key. Work from the top of the key down instead of trying to do multiple keys at once. Next, wipe each key with a damp cloth with just water on it to remove any soap residue. The RockJam Keyboard is our favorite. 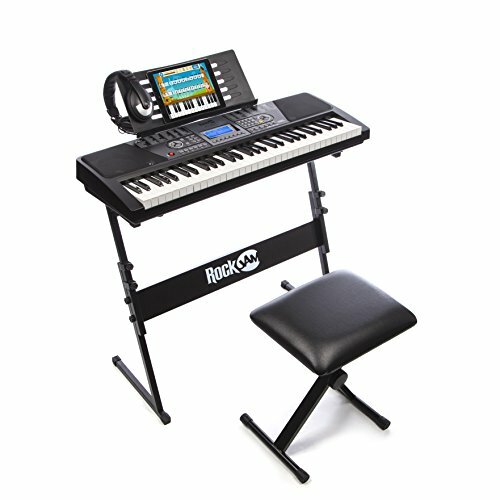 Not only is the keyboard easy to use and comes with a ton of features including a lesson mode and plenty of different sounds, but it also includes a stand, headphones, power supply cord, and bench. For the extra small pianists, the Amy & Betton Piano Keyboard is adorable and functional and will get kids interested in learning the piano. But if you can’t keep them sitting still very long, check out the Play22 Playmate. They’ll be hopping from key to key, and who knows. You may even want to join in on the fun!